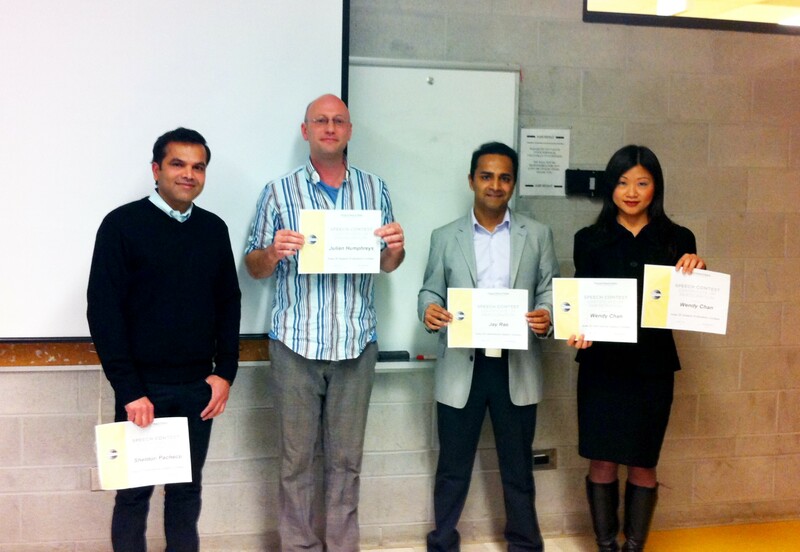 “On Wednesday March 7th, Liberty Village hosted the Area 26 International Speech and Speech Evaluation Contest. Along with the winners from our club, Jay and Julian, who competed against winners of other clubs in our area. The target speaker was our very own Arvind K. who delivered a speech about the Mobile Marketing Market with a speech entitled “Empowering MMM.” He received 3 fantastic evaluations from the competitors with tips we’re sure he’ll use in his future speeches. From there, we moved into the prepared International Speech Contest, where we heard some brilliant speeches that were both engaging and inspiring with a little emotion involved. The judges must of had a hard job judging both contests. This entry was posted in Uncategorized and tagged international toastmasters speech contest, liberty village, liberty village toastmasters, toastmasters, toronto toastmasters. Bookmark the permalink.